Enjoy the Music.com now offers the January/February edition of Superior Audio and the January edition of our Review Magazine. Superior Audio offers equipment reviews including First Sound's Presence Deluxe Statement preamplifier, Meadowlark's Blue Heron2 loudspeaker, and the Meridian G51 receiver. Our Review Magazine includes a world premier of Cabasse's Bahia loudspeaker and headphone amplifier reviews including the Emmeline SR-71, Graham's Slee Solo MC and the Aural Audition. For the audio cheapskate and DIY we have articles of inexpensive loudspeaker supports plus the T-Rex SET DIY amplifier. Naturally the Enjoy the Music.com™ Review Magazine also embraces many music reviews plus editorial articles. See the January/February edition of Superior Audio by clicking here. The January Review Magazine can be seen by clicking here. The Recording Industry Association of America (RIAA), a trade group that represents the United States recording industry whose members create, manufacture and/or distribute approximately 90 percent of sound recordings, have filed a new wave of copyright infringement lawsuits against 754 individual file-sharers. "With legal online retailers still forced to compete against illegal free networks, the playing field remains decidedly unbalanced," added Sherman. "That's why continued enforcement against individuals stealing and distributing music illegally is essential, as is holding accountable the businesses that intentionally promote and profit from this theft." In related news, the largest law enforcement operation against CD manufacturing plants producing and selling counterfeit music was conducted recently. Los Angeles County Sheriff's Department acted on five raids simultaneously that involved over 65 detectives. "Virtually unprecedented in size and scope, today's anti-piracy operation by the Los Angeles County Sheriff and others delivered a significant blow to piracy during a critical sales period for the recording industry," said Brad Buckles, Executive Vice President, Anti-Piracy, RIAA. "CD plant piracy is particularly damaging because the counterfeit goods produced tend to appear more authentic and often end up in legitimate music distribution chains." April Music is planning to feature their first ever single box preamplifier that includes digital upsampling at the Consumer Electronic Show (CES). The new SP200 expands upon the company's DP200 by adding multi-channel functionality plus analog pass-through option. Digital sampling rates include 48kHz, 96kHz, and 192kHz at 24-bits. April Music's new DP200 also includes headphone output that is driven by audiophile-grade amplification. Audio Note now offers low power copper/copper, copper/silver, or all silver wired C-Core output transformers (£96 to £902) to augment their already extensive line of Group A economy and Group B mid-priced transformers. Although designed for the 2A3 output tube, the new low power C-Core output transformer is said to produce good results with a single 300B. The transformer has a 2K5 primary impedance with 4 and 8 ohm secondaries and 90 mA standing current. The transformer also includes frames for mounting either horizontal or vertical. A solid copper shroud can be employed instead of the frame. Snow Monsters, a national children's kids ski and snowboard program, is yet another company who is suffering through legal tangles with the cable manufacturer Monster Cable. Monster Cable has been very aggressive in opposing anyone from using the Monster name, though the word is common within the English language. In a preemptive move, Snow Monsters has filed a lawsuit against Monster Cable in Denver Federal Court to stop Monster Cable from destroying a national ski and snowboard program that is said to not infringe or dilute Monster Cable's trademarks. Around June of 1997, John R. Turner who is founder and President of Sirdar (the creators of the Snow Monsters program), wrote a children's song about skiing and snowboarding which he named Snow Monster. An audio CD also came out with songs teaching children various ski safety messages and later a screenplay video featured imaginary characters called Snow Monsters was also offered. Mr. Turner is a former member of the United States Ski Team (1976-77), served as a coach, was the Nordic Competition director of the United States Ski Association, a television commentator, and producer of World Cup races and international events. He also is a contributing writer to various skiing and snowboarding magazines. Now Mr. Turner of Snow Monsters faces what some consider legalized extortion. Monster Cable's legal representative David Tognotti has been in various talks with Mr. Turner of Snow Monster. To quote the Snow Monster website "Tognotti demanded that Sirdar give up all rights to use SNOW MONSTERS, and provided Turner with a proposed licensing agreement that, among other things, required Sirdar to license the SNOW MONSTERS mark from Monster Cable, gave Monster Cable the right to approve or reject the manner in which Sirdar’s SNOW MONSTERS mark would be used, and required Sirdar to pay a royalty fee to Monster Cable, the amount of which was to be negotiated." In simple terms, this amount to Snow Monsters giving up their legally held name to Monster Cable, then licensing it back from them for various royalty fees. Other companies Monster Cable has legal wrangles with include Metropolis Entertainment's Monsters Wanted, Hansen Beverage Company's M Monster Energy, Duane C. Blake's Monster Seats, Discovery Communication's TV show Monster Garage, Monster Tower, Bally Gaming International's Monster Slots, Simple Wishes' Monsters Of The Interstate, and Net2Way's Monster Baseball. Click here to read the Monster Snow website's information on this recent development. More on this subject can be seen by reading Enjoy the Music.com™'s November 2004 editorial (click here). Sony and Pioneer, who have given stern warning to playing the new DualDisc format within their electronics (see 11/8/04 news), Meridian Audio has released a statement saying the new format works within many of their digital disc units and will not damage customer's units. DualDisc is a new two-sided music disc with one or more DVD layers on one side and a CD-compatible layer on the other. While the disc itself may be slightly thicker than a normal CD or DVD disc, the DVD side is consistent with the industry standard DVD specification. The CD side, on the other hand, is not compliant with the industry standard Red Book CD at (typically) 0.9mm rather than 1.1mm thick. Sony's proprietary SACD encoding is not part of the DualDisc format. Some DualDiscs feature DVD-Audio with Meridian Lossless Packet (MLP) encoding. The DVD side may also include DVD-Video, stereo PCM and/or lossy-compressed stereo or surround formats. Meridian has released a statement claiming their DVD players (586, 596, 598, 800, G98, G91) "play the DVD side perfectly. If you own a Meridian DVD player you should use this side of the disc. Our DVD players, in general, do not always play the CD-compatible side because the player optics are not designed for such thin CD layers. We do not propose to make any modifications to our DVD player designs because these components are highly optimized for playability of Red Book CD and DVD. Please play the DVD side and enjoy the highest sound quality offered by DualDisc." As for Meridian's CD-only players, their MCD, Pro-MCD; all 200 Series players; all 600 Series players; 500, 506, 507, 508 and G07 will play the CD side of the DualDisc format. 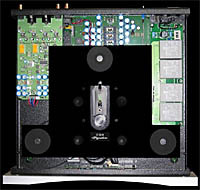 Meridian's ROM-based CD players (588 and G08) need an inexpensive modification that allows these players to play the DualDisc format. Looking to further educate the public, Meridian states "Meridian is also aware of another 2-sided DVD-based disc format called DVD-Plus or OneDisc, which is thicker than DualDisc (typically 1.55mm). In the few cases we have tested, both CD-compatible and DVD-compatible layers appear to function in all our players, and no harm can come to our players by trying them. Meridian does not make any claims as to the suitability of either type of disc for other manufacturer’s equipment, and Meridian does not warrant that our CD players are 100% compatible with DualDisc." In a move said to be a win-win situation by a member of the high-end audio, the Consumer Electronics Association (CEA) and the Electronic Industries Alliance (EIA) will withdraw their mutual affiliation effective January 1, 2005. High-end audio's Kathy Gornik, president of Thiel Audio Products, is one of the EIA's Board Member and Sector Representative, said This agreement marks a 'win-win' for both CEA and EIA. This move allows both organizations to grow and prosper as we focus squarely on meeting the needs of our distinct constituencies. This is simply the natural evolution of CEA's separate incorporation and the new structure created by EIA in 1999." CEA President and CEO Gary Shapiro said, "Our association has grown by leaps and bounds since we became separately incorporated. Our membership has increased by 300 percent, we have turned the International CES into the world's largest annual trade show for consumer technology and we have continued moving forward in our mission to grow the consumer technology industry. We are excited to see what heights we can now reach as a fully independent association." CEA and EIA will continue to share their mutual headquarters in Arlington, Va.
Cary Audio Design has announced their new CAD 500 MB balanced monoblock amplifier, CAD SLP 05 balanced preamplifier, and CD 306 SACD player. The new CAD 500 MB amplifier is rated at 500 watts (8 ohms) with a balanced, FET-based input stage. Cary Audio's CAD SLP 05 preamplifier uses vacuum tubes and includes a high gain or medium gain MM/MC phono stage with variable cartridge impedance loading. A Cinema Bypass section, Tape Monitor Loop, pair of XLR inputs, and three RCA inputs plus tube amplified headphone amplifier is also included. It comes standard with an external power supply utilizing vacuum tube voltage regulation. Those who enjoy SACD can look forward to the Cary Audio Design flagship CD 306 SACD that also acts as a transport/processor for CD with upsampling to 768kHz. Multiple Burr Brown DAC chips operate running in parallel to achieve high sampling rate accuracy. The unit also features dual power transformers, dual power supplies, and full regulation. No prices have been announced at this time. Weighing in at 27 lbs, Metronome Technologie's new CD3 Signature CD player/transport features top loading and a modified Philips CDM12 pro 2 V6.1 laser mechanism. A total of four transformers insure power to the laser, servo, and control functions are pristine. For digital to analog duties, 24-bit/192kHz bitstream technology with 120dB of signal to noise ratio is employed and feeds both single ended (RCA) and balanced (XLR) analog outputs with 2.5V maximum output. Digital output is via S/PDIF (RCA) while a rear switch enables turning off the display. Dynamic range is 120dB, total harmonic distortion is -110dB, and interchannel phase deviation is 0.0°. Stack9 has announced their home wide digital media 9100 Series, 9300 Series, 9500 Series, and 9500Pro Series ($3,295, $6,450, and $9,450 respectively). Stack9's line of integrated, easy-to-use components allows individuals to manage their libraries of digital movies, music, photos, CDs, digital video games and other digital video content including downloadable audio, radio, TV, and HDTV programs. Manufactured in the United States, each unit includes a massive internal hard drive and is equipped with numerous inputs and outputs for an extensive variety of audio, video, and information formats including surround sound. Designed around an Intel Pentium 4 hyper-threading processor, Microsoft's Windows Media Center 2005 operating platform is the base operating system. The Digital Media System 9100 Series is Stack9's entry-level component and includes 512MB of memory and 250GB of disk capacity with the capability of playing back 24-bit audio with multi-channel playback in 5.1, 6.1 and 7.1 surround sound. Videophiles can enjoy either NTSC and PAL viewing standards with a built-in TV tuner plus component video outputs for high-definition monitors. Additional ports accommodate cables for RS232 control; Ethernet, USB and FireWire connectors; optical and coaxial S/PDIF audio outputs, and X10 and ZWave home control features. A multi-format flash-card reader accepts downloads from digital cameras and a host of other digital devices. The 9500 Series is targeted towards videophiles and audiophiles with 2GB of memory and 1.5 Terabytes of disk capacity. A wireless 802.11g capability is also included for LAN distribution of digital content throughout the house. Enjoy the Music.com would like to thank those who have joined us in supporting high-end audio. Our new advertisement campaign will name those who have been active within our website over the years and also newcomers who appreciate our efforts. Those of you who want to join us, please feel free to click here and support our efforts in promoting high-end audio worldwide. You will also benefit by seeing your name appear within our audiophile print advertisement! Chris Sommovigo, designer of Illuminati digital cables now under the Kimber name, now heads Stereovox cables and Xhadow connectors and have new cables to their product line. The Xhadow Reference RCA (pictured here) is offered in two sizes, standard and large. Also new to Stereovox is their Studio Line HDLS High Definition Loudspeaker cable ($300 up to 1 meter plus $100 per additional 0.5 meter) based on the company's RTC tubular copper conductor. 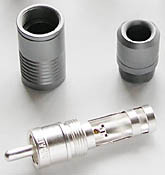 Also featuring a compliment of silver-plated copper 38 AWG conductors forming a thinner, multi-filar tube in the second layer, they are internally insulated in PTFE Teflon with individual FEP jackets to insure high quality insulation. The pair of conductors are terminated with silver-plated copper spades or can be upgraded ($80) to Xhadow Reference bananas. A bi-wire and Shotgun arrangement is also available ($600 up to 1.0mpr plus $200 per additional 0.5 meter). Stereovox's new HDX2 110 Ohm AES/EBU cable ($350 up to 1.0 meter plus $100 per 0.5 meter) uses the Xhadow Reference XLR connectors. 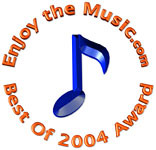 The 47th Annual Grammy Awards, scheduled for February 13th 2005, will event will also be covered for the fifth consecutive year by Enjoy the Music.com. While mainstream musical artists receive nominations including Kanye West with ten, Alicia Keys and Usher with eight, and Ray Charles earning seven, there is also jazz, classical, technical, and recording engineers Grammy nominations. Best Jazz Vocal Album nominees include Andy Bey's American Song, Jamie Cullum's Twentysomething, Al Jarreau's Accentuate The Positive, Queen Latifah's The Dana Owens Album, and Nancy Wilson's R.S.V.P. (Rare Songs, Very Personal). In 2004 popular audiophile recording engineer Doug Sax earned a Grammy for technical excellence. The entire nomination list can be seen by clicking here. Enjoy the Music.com™'s 2004 Grammy Awards show coverage can be seen by clicking here. Enjoy the Music.com has updated our Audiophile Audition and The Abso!ute Sound section of the website. We have the complete table of contents of both magazines plus a review of the McCormack UDP-1 Universal Disc Player from Audiophile Audition. The Abso!ute Sound's editorial titled 'The High-End Driving Force' justifies the logic of why ultra-fi products are so expensive. Editor of the Abso!ute Sound, Robert Harley, states "But the primary reason why some high-end products cost as much is that the product can not be designed, manufactured and sold for any less without compromising performance." Audiophile recording label Chesky Records is celebrating the holidays by offering customers 25 percent off all their titles. This discount includes CD, SACD, and DVD-Audio titles. Simply order online and before finalizing your online order enter CheskyHoliday in the 'Discount Code Field.' Click 'Apply Discount' to update your order and finalize your order. New titles from Chesky Records include The 52nd Street Blues Project Blues & Grass, Ana Caram Hollywood Rio, and Marta Gomez Cantos De Agua Dulce. Classé Audio just announced two new audio/video (A/V) units. The SSP-300 and SSP-600 ($4,500 and $6,500 respectively) multi-channel AV preamplifier/processors combine video processing and routing including many Dolby Digital and DTS modes. Difference between the SSP-300 and SSP-600 are with standard single ended (RCA) versus fully balanced (XLR) audio. Both models provide 7.1-channels of single-ended outputs using RCA connectors and Classé Audio's Delta range TFT color touchscreen display. Audio is processed by accurate digital-to-analog decoding mated with high-end analog amplification while the video section features wideband component-video inputs with component monitor-output. An array of S-Video (five) and composite (four) paths are included for videophiles. Cirrus Logic's two new 24-bit/192 kHz, multi-channel digital-to-analog converter (DAC) chips, the CS4365 and CS4385, support six and eight audio channels and decode Super Audio CD (SACD) and DVD-Audio. These new chips replace the company's first-generation multi-channel DACs (CS4362 and CS4382). By improving overall low-noise performance, an advanced multi-bit Delta Sigma architecture with integrated mismatch noise shaping technology results in dynamic range and THD+N specifications of 114dB and 100dB respectively. Additional new features include a TDM serial interface and a proprietary Direct Stream Digital (DSD) processor for SACD applications, allowing for volume control and on-chip 50kHz filtering without an intermediate decimation filter stage. Enjoy the Music.com™'s December Review Magazine celebrates our picks of great music as reviewed during 2004. Our annual Blue Note Best Of 2004 Awards for equipment can be seen by clicking here while our music awards can be seen by clicking here. This month's edition of our Review Magazine includes expert assessments of Nelson Pass' First Watt amplifier, the Logitech Harmony remote, NAD's NAD T763 receiver, plus loudspeakers by Penaudio and Von Schweikert. Broadcast radio enthusiasts will be delighted to read our appraisal of the Magnum Dynalab MD-106T tuner. See the December issue of our Review Magazine by clicking here.